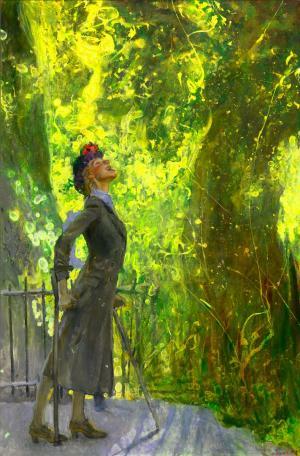 Now on view at the Brandywine River Museum of Art through May 5, 2019, a memorial exhibition celebrating the life of Phyllis Mills Wyeth (November 13, 1940-January 14, 2019) features a selection of portraits created by her husband, artist Jamie Wyeth. Phyllis Mills Wyeth: A Celebration includes works in a variety of media by Jamie Wyeth that reflect Phyllis&apos; vibrant spirit and love of nature, horses, and her ever-present dogs. From the late 1960s onward, Phyllis Wyeth served as a muse to her spouse and these intimate works capture moments from her life across the decades of their marriage. Phyllis Mills Wyeth: A Celebration features 28 paintings and drawings, ranging from the Jamie Wyeth&apos;s first portrait of her (Phyllis Mills, 1967)-depicted outdoors and covered in fallen leaves-to more recent work, such as the lushly painted Overslept (2018). Phyllis Wyeth was a member of the Bran­dywine&apos;s first board of trustees in the late 1960s and a major supporter of the organization. In addition to her work with the Brandywine she was a noted philanthropist, conservationist, environmentalist, arts supporter, accom­plished horsewoman and a staunch advocate for the rights of the disabled. The Brandywine River Museum of Art features an outstanding collection of American art housed in a 19th-century mill building with a dramatic steel and glass addition overlooking the banks of the Brandywine. The Museum is open daily from 9:30 a.m. to 5 p.m. (except Thanksgiving Day and Christmas Day), and is located on Route 1 in Chadds Ford, PA. Admission is $18 for adults, $15 for seniors ages 65 and over, $6 for students and children ages 6 and up; free for children 5 and younger and Brandywine Conservancy & Museum of Art members. Guided tours of the Andrew Wyeth Studio, N. C. Wyeth House & Studio, and the Kuerner Farm—all National Historic Landmarks—are available daily (for an additional fee) from April 4 through November 18; advance reservations are recommended. For more information, call 610.388.2700 or visit brandywine.org/museum. The Museum is one of the two programs of the Brandywine Conservancy & Museum of Art. Make the Brandywine River Museum of Art part of a weekend visit to Wilmington and the Brandywine Valley. Start planning your visit with our digital Visitors Guide.